Dutch Prime Minister Mark Rutte defeated anti-Euro rival Geert Wilders in the general election last week, bringing relief to other EU governments facing a wave of nationalism. The Centre-right People's Party for Freedom and Democracy (VVD) won 33 seats in the 150-seat house while Geert Wilders' Eurosceptic Freedom Party (PVV) won 20. A mainly centre-right coalition is likely with current PM Mark Rutte at its helm. 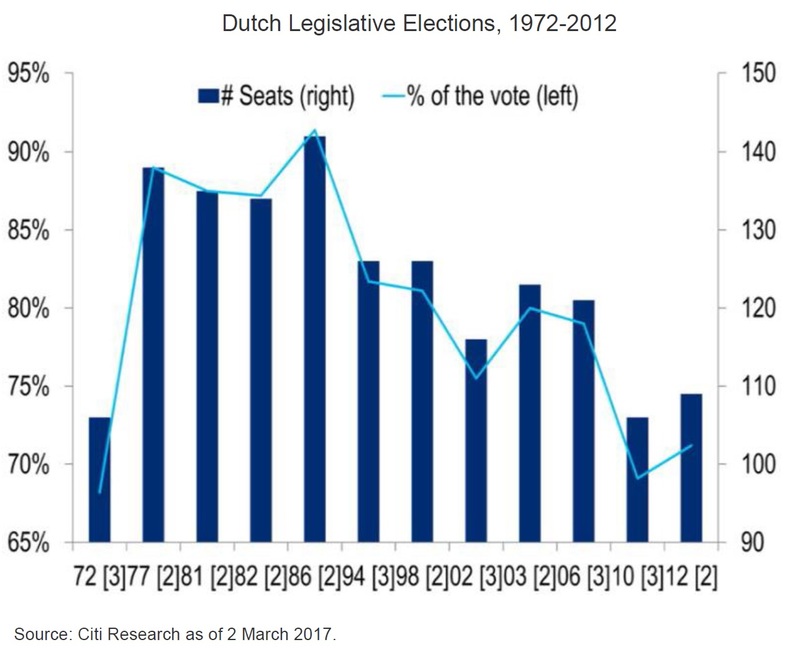 As the VVD did not received the 76 seats (out of 150) needed for an absolute majority in this election, Citi analysts expect PM Rutte to form a government with 3 or 4 more parties. Populist risk still very much in focus. Continued support for non-mainstream political parties and referendum risk is something to keep in mind during 2017 as the electoral cycle is only just beginning. The euro area's three largest member states are next, with elections in France (in Apr-June), Germany (in Sep) and Italy (before Feb-18). While the populist threat remains, the Dutch election outcome suggests that a relatively benign scenario for Europe's busy political calendar is possible. Given investors' still cautious stance towards European equities and the market's relatively attractive valuations (Forward P/E of Euro Stoxx is 15x vs. 18.5x for S&P500), Citi analysts believe there is potential for European equity markets to rally as the political uncertainty declines.